Since the introduction of the Dark Elves, the Dungeon town has been severely overhauled. Their creature ranks, however, remain rather similar to that of Heroes IV, with a few new additions. 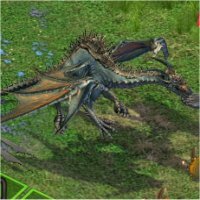 Having a high-level spellcaster at level 6, as well as the perennial 'strongest creature', the Black Dragon, as well as powerful auxiliaries such as the Hydra and the Minotaur, the Dungeon town looks to be a slow but powerful town. The only stumbling blocks are the high costs, and their relatively slow creatures. The main role for scouts on the battlefield is to make ranged attacks with their crossbows. They are also trained in close combat, however, and can defend themselves in melee. ShooterThis creature can inflict damage remotely. 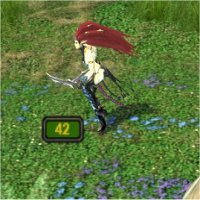 When distance to target is longer than half the arena, the target suffers only half the normal damage. Shooter cannot use ranged attack when blocked by enemy creature. If there's no Ammo Cart in the army, the number of shots is limited by available ammo.. No Melee PenaltyShooter has no penalty for damage inflicted during melee attack.. Range PenaltyShooter always inflicts only half the normal damage to the target but doesn't incur any penalty on melee attack.. The Scout is a fast and expensive level 1 shooter. Its high iniative allows it to gets shots away before its numbers can be significantly cut, and its damage for a level 1 is outstanding. 5 shots isn't substantial for long battles, but thankfully, it comes with a no-melee penalty, making it an effective melee fighter too. Cost is the only issue. 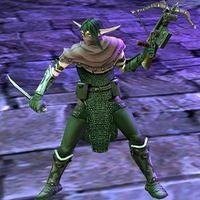 The main role for the assassins on the battlefield is to make ranged attacks with their deadly crossbows. Using enchanted bolts they inflict grievous, poisoned wounds on their enemies. ShooterThis creature can inflict damage remotely. When distance to target is longer than half the arena, the target suffers only half the normal damage. Shooter cannot use ranged attack when blocked by enemy creature. If there's no Ammo Cart in the army, the number of shots is limited by available ammo.. No Melee PenaltyShooter has no penalty for damage inflicted during melee attack.. 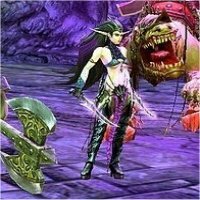 Poisonous AttackIn addition to normal damage the enemy attacked will also be poisoned. 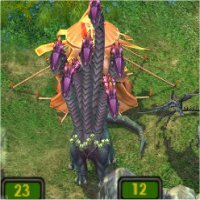 Poisoning will cause a certain amount of damage during the next three turns.Poison damage is proportional to the number of creatures in the attacking stack (at the time of poisoning). Multiplier is 1 for Assassins and 4 for Manticores.. Range PenaltyShooter always inflicts only half the normal damage to the target but doesn't incur any penalty on melee attack.. The Assassin is a slightly improved version, and is worth the 30 extra gold. The added 4 Hit Points are especially welcome due to their relatively high numbers compared to other Dungeon troops. Their poisonous attack is excellent considering their low number of shots. Their initiative has been enhanced again to make sure it gets shots away even earlier (especially effective in the early game where other low-level creatures have substantially lower initiative). Blood Maidens are lightning-fast female warriors who practice a deviant form of the Elven Battle Dance. They move quickly to reach their opponent, strike, and return to their starting place, all in one blur of motion. Strike and ReturnCreature attacks and returns to its previous position.. The Blood Maiden is a weak creature as far as Dungeon creatures go, and is the obvious substitute for the Harpy. While they are very effective on the offensive front, their defenses are so weak that they are easily defeated by almost any creature. Their saving grace in this respect is their high initiative and speed, so if they're lucky, they might just be able to scramble out of trouble. Blood Furies are the elite warriors of the Dark Elf armies. So well trained are they in their own form of Battle Dance that they can charge and evade in the same strike, preventing their foes from reacting and retaliating before they are gone. Strike and ReturnCreature attacks and returns to its previous position.. No Enemy RetaliationEnemies never retaliate after melee attacks by creatures with this ability.. The No Retaliation special is a much needed improvement for the defensively incapable Blood Fury. No Retaliation allows them to outlast their downgrade in combat, and their increased defense, initiative, speed and Hit Point ratings do likewise. This upgrade is definitely worthwhile if they are to be worth their money. Along with the other Beastmen, the Minotaurs, half-man and half-bull, were created by the Wizards of the Seven Cities as replacement for the Orcs. They fled east, and underground, to earn their freedom, but they were later conquered by the Dark Elfs and once again bound in chains and muzzled. In the Dark Elf society, the Minotaurs are used as menial labour to perform the most degrading and tedious tasks. Despite this treatment, the Minotaurs are known for their bravery and dignity. They will perform any task to the utmost of their ability, including fighting for those who treat them as slaves. They hope some day to earn their freedom; the Dark Elves fear that some day, they will seize it instead. BraveryCreature always has positive morale (no less than +1).. 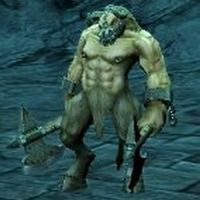 The Minotaur has easily the highest Hit Points of any level 3 creature. Unfortunately, their defence is very low, much like the rest of their statistics, aside from damage which is acceptable, though the range is too large. They are easy targets for ranged attackers due to their low initiative, so haste is a good spell to use here. The greatest of the Minotaur fighters receive additional gladiator training, and are rewarded by being promoted to Guards. They are tattooed with their badges of office and use deadly double-bladed axes with great skill, dealing two heavy blows in sequence. BraveryCreature always has positive morale (no less than +1).. Double AttackCreature strikes two blows at the target in a single attack.. The Minotaur Guard is only a very small statistical upgrade, but the double attack effectively doubles their damage, and their range (3 -> 6). The disparity between their attack and defence values encourages more offensive strategies, which necessitates the use of haste and bless. Their Hit Points have been improved to a gargantuan 35, 4 better than their nearest rival (the Minotaur), and on par with most level 4s. Dark Raiders are the backbone of the armies of Ygg-Chall. 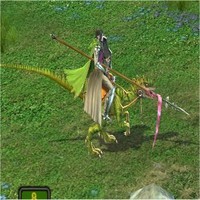 They are well-trained, armoured warriors, mounted on great lizards, who ride into battle with a heavy lance and shield. Speed is their main weapon, and the damage they wreak with their lances depends on the distance over which they accelerate. Large CreatureThis creature takes 2x2 squares on the battlefield.. Rider ChargeFor each battlefield tile covered by this creature during attack, the target's Defense is reduced by 20% (all the way down to zero).. 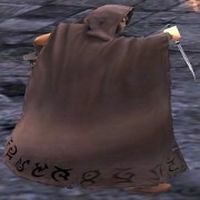 Though weak in attack and defense values, it is the Dark Raider's initiative, Hit Points, and good damage (also through Charge) that make it a favourable addition to the Dungeon army. Their speed and initiative is best put to use down the flanks where obstacles are minimal, which allows them to make use of their charge ability. Though expensive, their cost is illustrative of their ability. Grim Raiders are similar to their less-powerful brethren. They are far more skilled, however, and their lizards are trained to bite their enemies. Large CreatureThis creature takes 2x2 squares on the battlefield.. Rider ChargeFor each battlefield tile covered by this creature during attack, the target's Defense is reduced by 20% (all the way down to zero).. Lizard BitePerform an attack against neighbouring enemy and inflicts half the regular damage, if this enemy is attacked by an allied creature..
With improved attack and defense ratings, Grim Raiders are cured of the Dark Raider's main weakness. Add to that higher Damage and Speed, as well as the highest Hit Points for a level 5, and you have every reason to use them offensively. Though the cost of the upgrade is considerable, it is nevertheless an elementary upgrade. Lizard Bite is particularly useful around numerous creatures, and is devastating in tandem with the Blood Fury's non-retaliatory strike and return. Hydras are another race of underground creatures tamed and enslaved by the Dark Elves. Their origins are unknown, although they seem to be related to the Dragons in spite of their very limited intelligence and lack of magic power. However, Hydras are incredibly strong, and their multiple heads can strike simultaneously at different opponents. Large CreatureThis creature takes 2x2 squares on the battlefield.. Three-headed AttackThe creature can attack simultaneously all enemy creatures standing on three adjacent cells.The Cerberus attacks 3 adjacent tiles. The Hydra attacks 6 adjacents tiles.. No Enemy RetaliationEnemies never retaliate after melee attacks by creatures with this ability.. EnragedThis creature's attack increases during combat when any friendly unit dies (except resurrected creatures or creatures summoned to battlefield by magic).The increase is proportional to the killed stack relative power in the army..
Aside from Hit Points and great abilities, the Hydra is a below average level 5 creature statistically, as much as it pains me to say so. While speed is acceptable, considering its size, initiative, attack, defense and damage are all sub-par. Haste and Teleport are two spells you should hope turn up in the Mage Guild. It is also extraordinarily expensive, like most other Dungeon creatures. Deep Hydras are older than other Hydras and have six heads instead of three. This permits them to both deal more damage and strike more enemies. Large CreatureThis creature takes 2x2 squares on the battlefield.. Six-headed attackCreature attacks all adjacent tiles simultaneously, causing damage to all enemy creatures positioned there.. No Enemy RetaliationEnemies never retaliate after melee attacks by creatures with this ability.. RegenerationCreature restores its health by 30 - 50 HPs each turn.. EnragedThis creature's attack increases during combat when any friendly unit dies (except resurrected creatures or creatures summoned to battlefield by magic).The increase is proportional to the killed stack relative power in the army..
Other than the huge Hit Point upgrade to an already sizeable amount, the Deep Hydra offers little other improvements. Its regeneration ability serves only to increase its seemingly bottomless pit of Hit Points, and is particularly useful in low numbers of Deep Hydras. Its six-headed attack once again means it could potentially deal 84 damage, though due to its size, it is unlikely that it will be able to attack more than 3 other units. 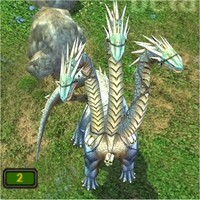 The Deep Hydra makes an excellent garrison unit - unless you can find spells to maximise its damage output. The Shadow Witches are priestesses of Malassa They use their whips in close combat, but are far deadlier with their spells of dark magic. ShooterThis creature can inflict damage remotely. When distance to target is longer than half the arena, the target suffers only half the normal damage. Shooter cannot use ranged attack when blocked by enemy creature. If there's no Ammo Cart in the army, the number of shots is limited by available ammo.. CasterThis creature can use a set of magical spells similar to those cast by heroes. Mana reserve is limited but always set to maximum at the beginning of combat. Spellpower depends on the number of creatures (activated ability).. The Shadow Witch's strength outdoubtedly lies in its ability to attack from range - with either spells or a ranged attack. Hence, their statistics aren't at all spectacular, faltering in Speed, Hit Points and attack and defense ratings especially. 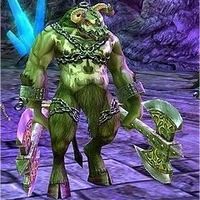 Its 4 shots are hardly sufficient, either, but Dungeon are desperately in need of such a ranged attacker. The Shadow Matriarchs are the ruling elite of the Dark Elf armies. If pressed into close combat they use whips as weapons, but prefer to rely on their much more potent magics. The Matriarchs have more spells at their disposal than the Witches. ShooterThis creature can inflict damage remotely. When distance to target is longer than half the arena, the target suffers only half the normal damage. Shooter cannot use ranged attack when blocked by enemy creature. If there's no Ammo Cart in the army, the number of shots is limited by available ammo.. CasterThis creature can use a set of magical spells similar to those cast by heroes. Mana reserve is limited but always set to maximum at the beginning of combat. Spellpower depends on the number of creatures (activated ability).. Whip StrikeThere's a certain chance that during a melee attack this creature will use one of the following spells, in addition to inflicting regular damage: Slow, Weakness or Berserk. (The spell does not work on undead, elemental and mechanical units. )The spell is cast with spell power 3.. The Shadow Matriarch is a small but all-around solid improvement from the Shadow Witch. All statistics have risen, but still low for a level 6 standard, aside from damage which is satisfactory. Its spells, while not particularly powerful, are sufficient when its shots are extinguished. 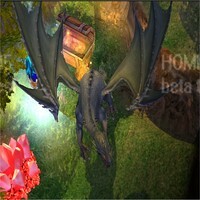 Shadow dragons live deep in the massive caverns of the far underground. Worshipped by Dark Elf society as avatars of their Great Mother, they tolerate their worshippers and occasionally ally with them. Even a single dragon is a terrifying opponent, its breath a burst of negative energy that can lay waste to even the toughest enemies. 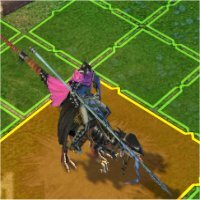 Large CreatureThis creature takes 2x2 squares on the battlefield.. FlyerThis creature can move on to any free tile on the battlefield during its turn, regardless of the obstacles in the way.. Fire BreathDuring attack, creature damages not only the target but any other unit positioned directly behind it.. While Attack and Defense ratings are quite poor, the Shadow Dragon shines in all other areas, particularly damage and speed. Its fire breath ability has returned, again wreaking havoc on tightly packed formations. It does not have magical immunity like its Black cousin, so make use of this and cast as many beneficial spells as possible. Black Dragons are the older, more powerful siblings of the Shadow Dragons. In addition to the skills their lesser brethren possess, Black Dragons are stronger and completely immune to magic. Large CreatureThis creature takes 2x2 squares on the battlefield.. FlyerThis creature can move on to any free tile on the battlefield during its turn, regardless of the obstacles in the way.. Immunity to MagicCreature is immune to all magical impact (including friendly spells).. Fire BreathDuring attack, creature damages not only the target but any other unit positioned directly behind it.. The ominous Black Dragon has returned, and it is once again a destructive force on the battlefield. It deals the highest damage of any creature, has excellent attack and defense ratings, blazing speed, great Hit Points. The only slightly mediocre element is its initiative, at a 'lowly' 10. Its magical immunity makes the Black Dragon very difficult to defeat, seeing as there is no creature that can even stand up to its physical prowess. Total Orientation: The Dungeon is not as balanced as some other towns, but contains all the vital pre-requisites for a successful town. Its main problem is its lack of flyers, and, to some extent, mid-level shooters. It has numerous walkers that are fast, with the exception of the Hydra and the Minotaur. The Dungeon possesses magical prowess in the the Shadow Witch and the Black Dragon. Varied strategies could be employed by the Dungeon to overcome its enemy - it does not lend itself to one in particular.